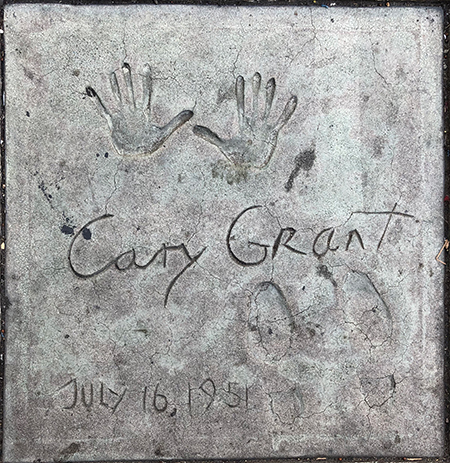 Cary Grant was a legendary leading man, whose screen persona carried him at the frontlines of stardom from the 1930s through the 1960s. He came to define sauve; directors of every kind of film wanted what Grant could bring to their pictures. He is just the most indelible male movie star ever. Born into difficult family circumstances, Grant's family were tailors, with his father being an alcoholic, and his mother, Elsie, a depressive. According to Grant, his childhood was "just horrendous." Elsie taugh her son how to sing and dance before age four, and took him to the cinema, where he saw Chaplin, Arbuckle, and Broncho Billy. By four-and-a-half, he was sent to boarding school. Having lost her first son John to tuberculous meningitis, Elsie was overprotective of Archie. When Archie was nine, his father told him that Elsie had died. Father Elias remarried, but did not allow Achie to live with his new family. Socially awkward, Achie loved the theatre, eventually apprenticing with the Bob Pender Stage Troupe, becoming a stiltwalker. Winning a scholarship to attend the Fairfield Grammar School, Achie was now popular, good at sports, aced all his classes and never did his homework. Hanging around theatres in Bristol gave him the chance to do the lighting for magician David Devant. Spending time in nearby port of Southampton induced a desire to "see the world." Expelled from school, Achie rejoined the Bob Pender Troupe, with Elias negotiating a contract that the Troupe would train him until he reached his 18th birthday — a more formal apprentiship. Achie excelled at pantomime; at age 16, the Pender Troupe left for a tour of America. While on the RMS Olympic, Archie met and played shuffleboard with Douglas Fairbanks, who was then on his honeymoon with Mary Pickford. Fairbanks became Archie's role model. Archie made his Broadway debut in the musical extravaganza Better Times in the 1922-23 season at the Hippodrome. Performing on the vaudeville circuit, Archie decided to stay in the U.S., where he became influenced by the Marx Brothers. He was cast in the musical Golden Dawn on Broadway in 1927, and received such good notices, that he was signed up at the William Morris Talent Agency. Eventually under contract to the Shubert Brothers, he was cast opposite Jeanette MacDonald in the musical comedy Boom-Boom on Broadway in Jannuary, 1929. Apparently, he was awful — charming — but awful. This was followed by two other musicals: A Wonderful Night in 1929-30, and Nikki with Fay Wray in the title role in 1931. Tested by Paramount, he was offered a five-year contract in late 1931 — if only he would change his name to something "more like Gary Cooper." They settled on Cary Grant. Although he thought his first film This Is The Night (released in April, 1932) stunk, other people didn't think so; he was cast opposite Marlene Dietrich in Blonde Venus (released in September, 1932). Grant was selected by Mae West to play opposite her in both She Done Him Wrong (released in February, 1933), and I'm No Angel (wwich had its premiere at the Chinese in October, 1933). Both were huge hits, putting Grant firmly on the map. His real breakthrough film artistically, came with Sylvia Scarlett (released in January, 1936), with Katherine Hepburn. When his Paramount contract lapsed, Grant starred in Suzy (played the Chinese in July, 1936) at M-G-M. Suzy became a hit, and Grant decided to become a freelancer, not tied to any particular studio. At this time, Grant discovered that his mother Elsie was still alive. Confronting his father Elias before his death, he admitted that he had lied to his son about Elsie's death. Grant supported the institutionalized Elsie, and was able to visit her in 1938. Grant enjoyed major comic success with the films Topper (which played the Chinese in August, 1937), followed by The Awful Truth (released in October, 1937), and Bringing Up Baby (released in February, 1938). By now, Grant was able to play slightly more serious roles in Gunga Din (released in February, 1939), and Only Angels Have Wings (released in May, 1939). An unprecidented run of hits followed, beginning with His Girl Friday (released in January, 1940), The Phildelphia Story (which played the Chinese in December, 1940), Penny Serenade (released in April, 1941), and Suspicion (released in November, 1941). Grant became an American citizen in 1942, but did not serve during World War II. His wartime film, Destination Tokyo (released in December, 1943), is a classic. So is Arsenic and Old Lace (released in September, 1944), and None But the Lonely Heart (released in October, 1944). With the war over, Grant reteamed with Alfred Hitchcock for Notorious (released in September, 1946), then skipped along in three outstanding comedies: The Batchelor and the Bobby-Soxer (released in September, 1947), Mr. Blandings Builds His Dream House (which played the Chinese in September, 1948), and I Was a Male War Bride (played the Chinese in August, 1949). Grant switched back and forth between thrillers and comedies. He was great in both: To Catch a Thief (released in August, 1955), then An Affair to Remember (which played the Chinese in July, 1957), then hanging off of Mount Rushmore in North By Northwest (released in July, 1959), then Blake Edwards' comedy Operation Petticoat (released in December, 1959), and That Touch of Mink (released in April, 1962), then, Charade (played the Chinese in December, 1963) with Audrey Hepburn. Grant's final film was Walk Don't Run (released in June 1966), after which he retired from acting. He spent his remaining years trying to put it together with one of his wives, and tending to his financial empire. He was about to make a personal appearance in Davenport, Iowa in late 1986, when it was discovered that Grant was having a stroke. He refused to be transferred to a hospital. After falling into a ocma, he was taken to hospital, where he died 45 minutes after arriving. He was 82. Grauman's Chinese Theatre, Hollywood, California. 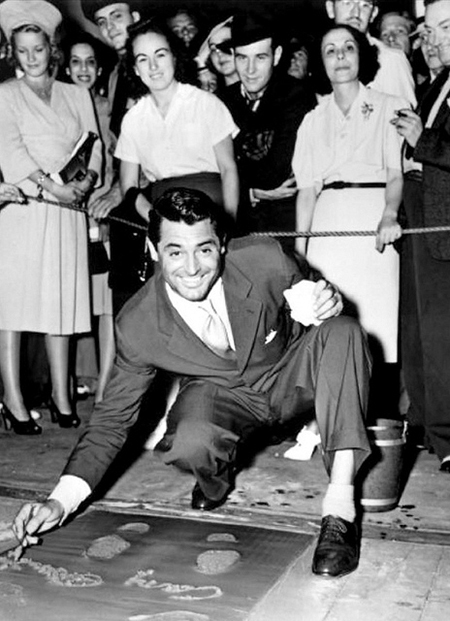 Cary Grant Forecourt ceremony, Monday, July 16, 1951. 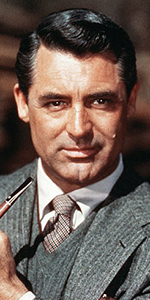 Cary Grant looks pretty happy during his imprinting, don't he?